Right. 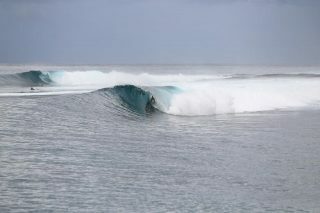 A classic Indo reef break with a defined peak take off. Fast waves for 200m with 3 distinct tube sections. barrels galore with speed runs in between. Handles most swell and really fires on larger swells. There is also a rouge heaving barrel about 100m up the point from the regular take off point that is regularly surfed by experienced natural footers, this section is aptly named “show offs”.